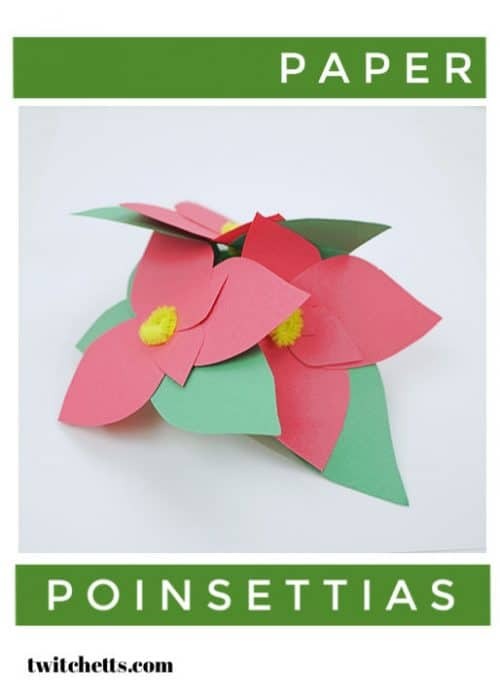 Create this paper poinsettia craft that kids will love to see decorating their house or classroom this year. 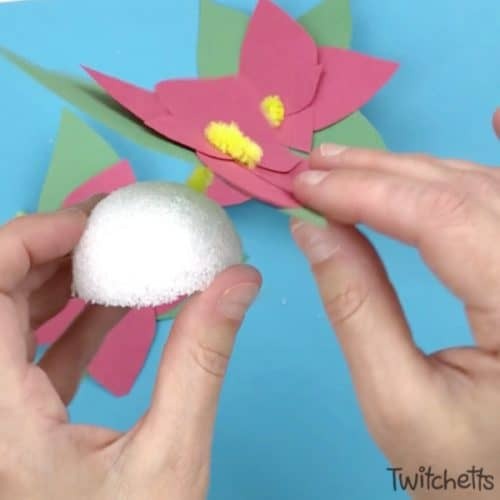 It’s a perfect poinsettia decoration for houses with pets and small children. 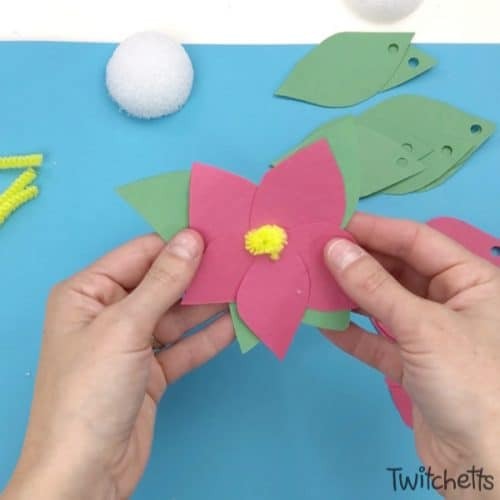 We love to make paper flowers with our little ones! With Christmas right around the corner, I realized we have never made a classic Christmas poinsettia before! 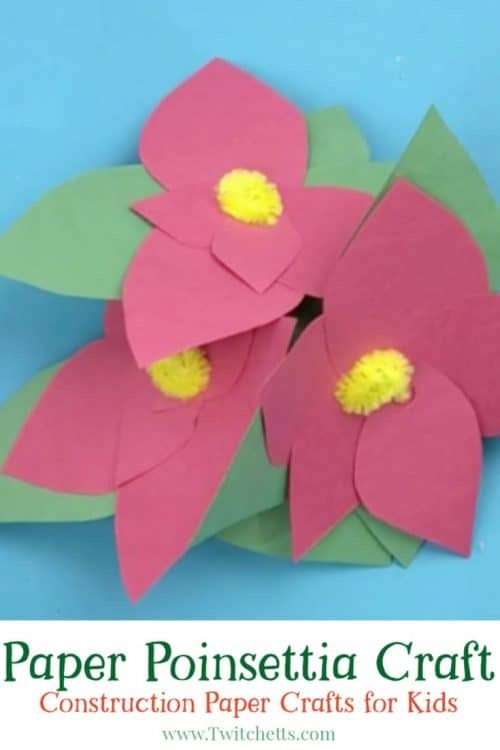 I really wanted to make something the little ones could make to add to the decor for the holidays and these flowers would look great on any mantle or used as a centerpiece for your holiday feast. 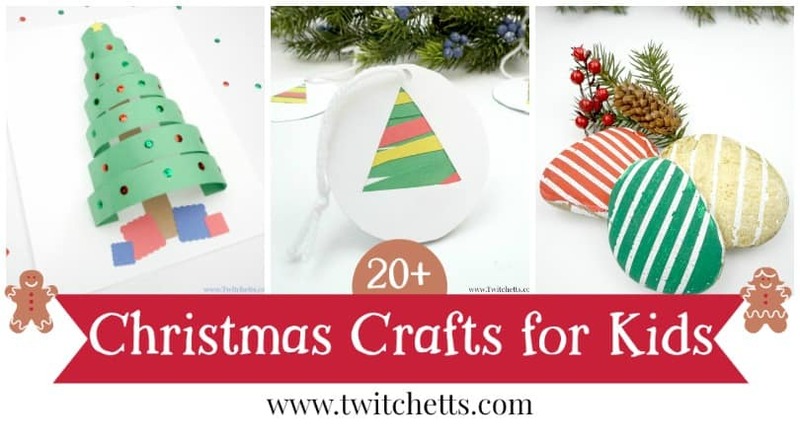 Not only is this paper poinsettia craft cute, but it’s also easy to create. 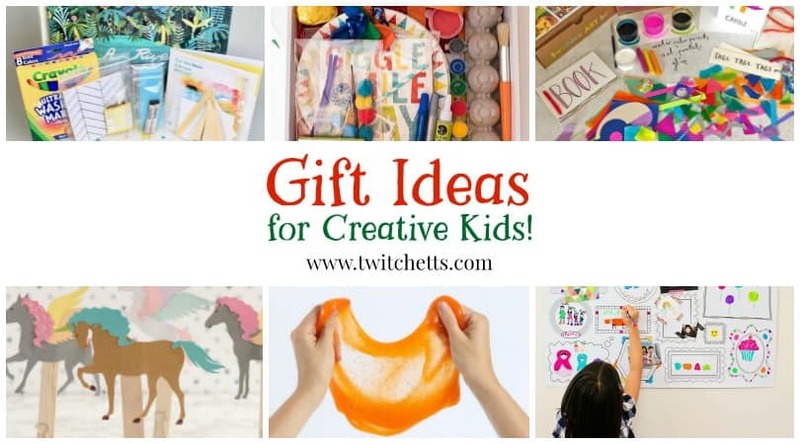 Which means it would be fun for a classroom of kids or a simple afternoon craft at your house. 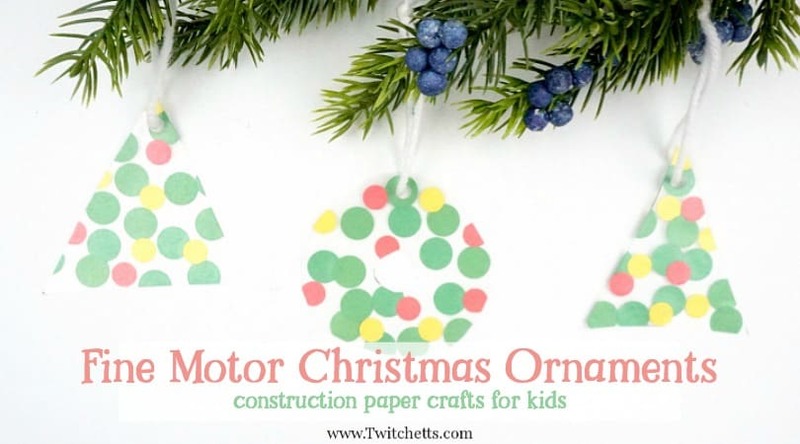 Need supplies for your construction paper crafts? 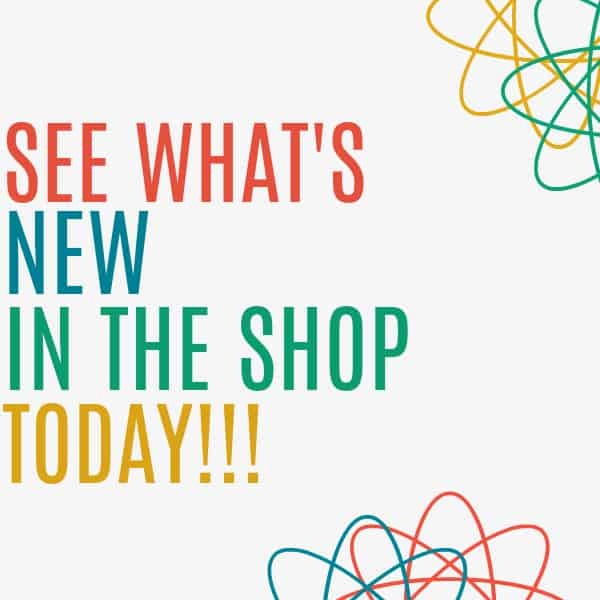 Check out our Amazon shop! 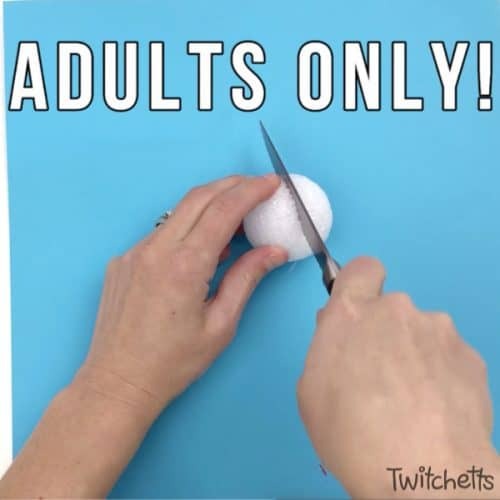 Start by cutting the styrofoam ball in half using the steak knife. 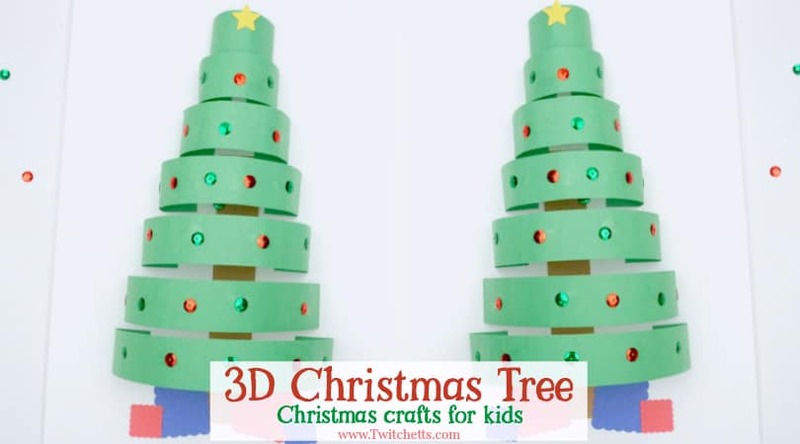 The serrated edges make this pretty simple, but I highly suggest this being done by an adult. Cutting something curved can be tricky and dangerous. 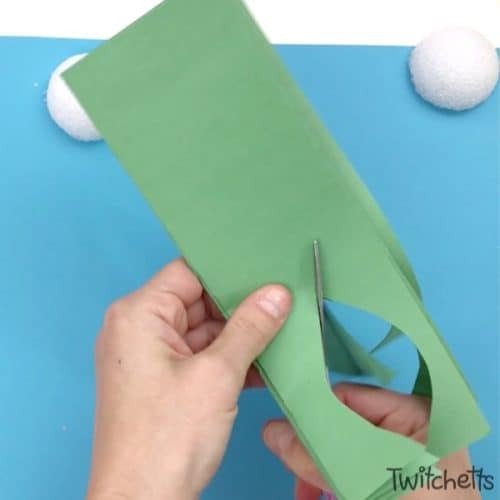 Take the green paper and fan fold it 3 times. This will divide the paper into wide 4ths. 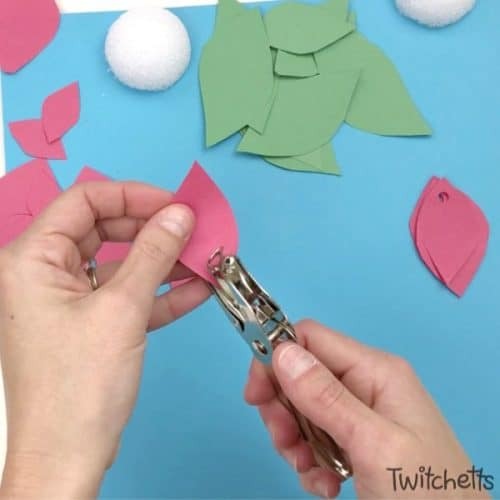 Now, using your scissors, cut out a bunch of leaves. 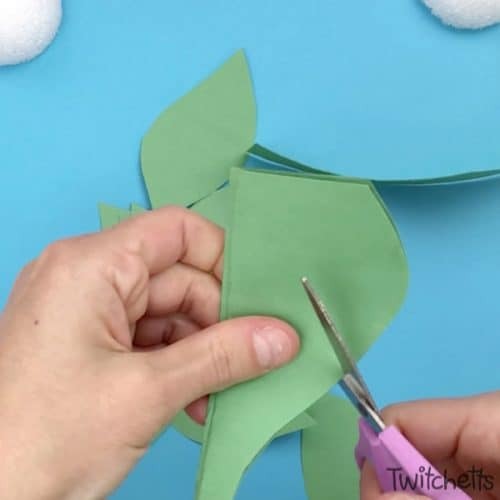 Try to fit 3 leaf shapes on the strip. 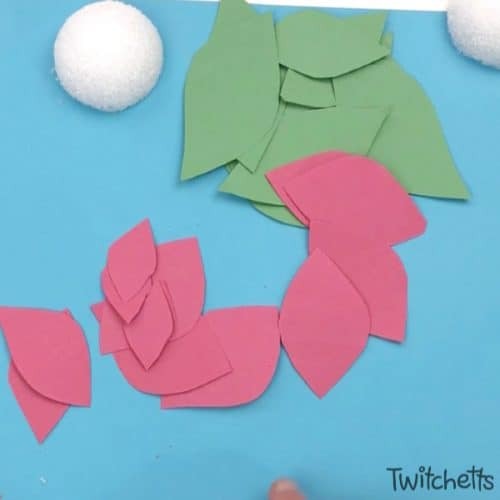 This will give you a total of 12 leaves. They do not have to be the same shape or size. Now fold your red paper the same way. The poinsettia pedals have the same leaf shape, however you want your pedals to get smaller. So start large and make each pedal smaller. Try to get 4 cut out of the strip, which will give you 16 pedals. Using a hole punch, create holes in the ends of all of your pedals and leaves. 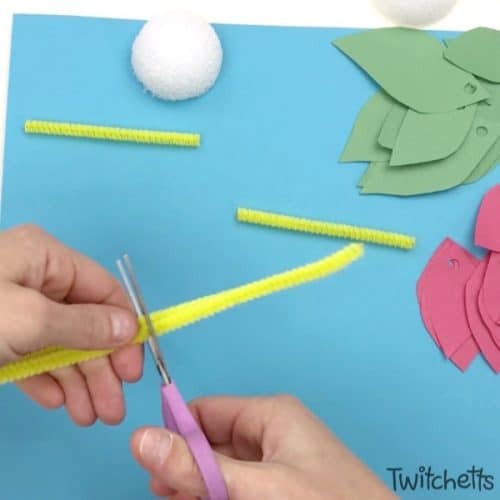 Next, cut your pipe cleaner into 3rds. Bend a little kink in the pipe cleaner to catch your leaves and pedals. Then start adding them on. 3-4 green then 4-5 red. 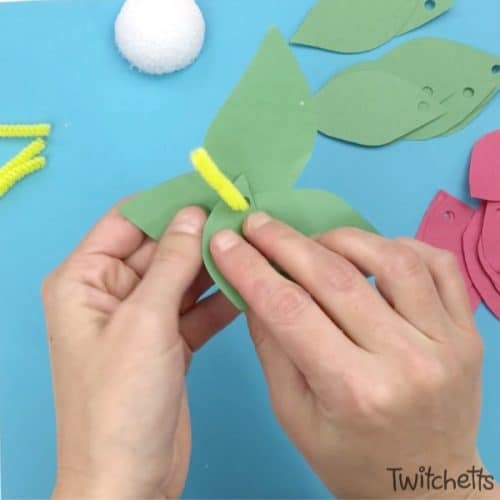 Pinch the pipe cleaner to make it tight then wrap the top in a spiral for the center of your flower. 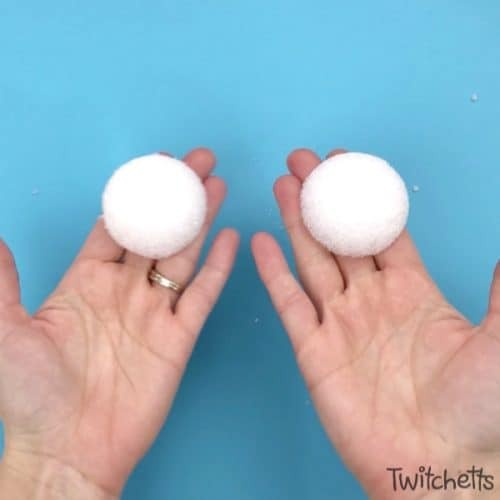 Poke the back end right into the round side of your foam ball. 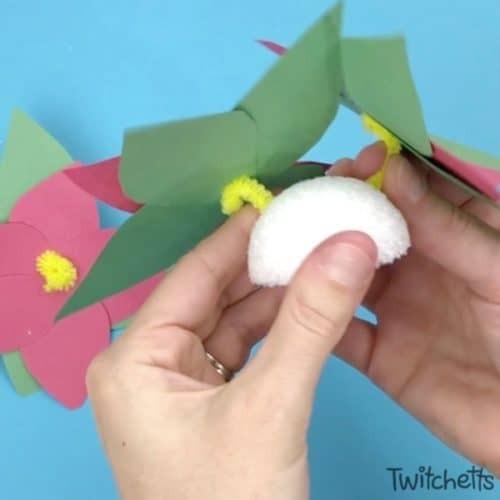 Place it off to one side as you will need to put at least 3 flowers in each ball. You do not have to push it all the way in. When all 3 are on you can place it right on the table! 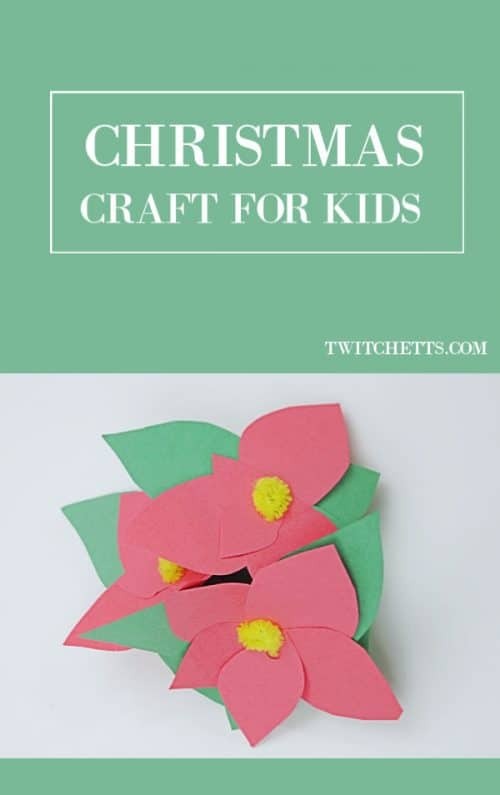 This paper poinsettia craft is fun for kids of all ages and even sneaks in some fine motor skills. 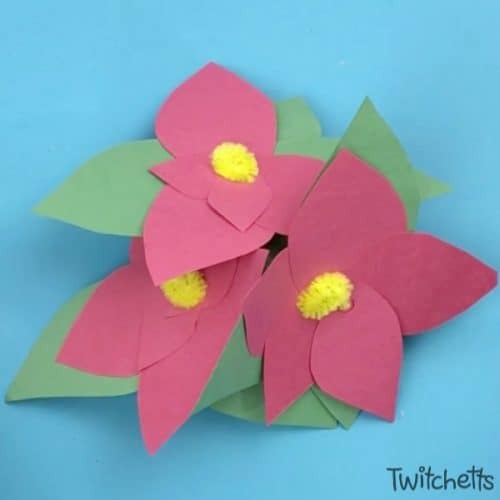 If you enjoyed this construction paper poinsettia, please pin it to your favorite Pinterest board!